This seventh installment of the Discover a Guitarist series is a guest post from Josh Urban of The Doghouse. John Petrucci – Cue the epic soundtrack – it’s the name that strikes fear into the hearts of the anti-heroes and people who somehow miss the point of all that is shredderific. He’s the topic of today’s blog post, and, much like one of those cheesy testimonials for a motivational speaker, I’d like to tell you how, many years ago, he changed my life. It was summer, it was hot, and my guitar teacher was going on, again, about using some gizmo called a metronome. His insistence came at the steady beat of three nags per week, much like a slower version of the very device he championed. My 13-year old ears, still not quite sold on the concept of guitar, scoffed at such nonsense. Then I told him what most guitar teachers dread to hear. “I’m going to take a break over the summer, but I’ll be back in the fall.” “No you won’t!” he said. Indignant, I disagreed. It would be years later that I finally realized, as a guitar instructor myself, that he was statistically right. Summer basically eats students. And my hiatus from weekly lessons would probably have stopped my career, if it weren’t for the hero of the day, John Petrucci himself. I wandered out into the humidity that is the Maryland summer, hoping I looked cool in my baggy jeans, bidding a temporary goodbye to the guitar shop with the rows of dream guitars gleaming softly on the walls. A few weeks later, (still practicing, thank you very much! ), I got to talking to a friend who owned a small record store. “Hey man, I’m going to send you some music you’ve gotta check out.” I said that sounded great, and a few days later, sure enough, there the box was, perched on the doorstep, having traveled a few hundred miles from Lexington, Kentucky. “Huh, what’s this?” I wondered, as I wrestled with the shrink wrap that refused to give up a shockingly pink and green CD titled Liquid Tension Experiment. I plunked it in the hulking plastic family CD player, and… my life changed forever. The first track was called “Paradigm Shift”, and it was aptly named. It was as if the stereo turned into a whirling dervish of alternate picking. John Petrucci, famous for his guitar work with Dream Theater, lit the house on fire, and with it, my ambition. Drummer Mike Portnoy, also of Dream Theater fame, put together the instrumental group, recruiting Tony Levin to handle all manner of bass duties, and Jordan Rudress to provide a sonic smorgasbord of keyboard sounds. Dimebag Darrell was first on Mike’s list for guitar slinger, but wasn’t able to participate due to scheduling conflicts. The drummer wanted to try something outside of the Dream Theater sound, and had also tried to recruit Steve Morse and Jim Matheos. However, at the suggestion of Mike’s wife, John’s name came up, and he was asked to join in. Hallelujah! My family got sick of hearing the progressive metal jam band that summer, but with my adolescent talent of being a team player, I ignored them. “OK.” I have been ever since. While I’m still a far cry from Mr. Petrucci, I’m pleased to say that I make a living teaching guitar, have self-released a CD, and am working hard at a career as a musician. I recommend that you give John a few minutes of your time, and listen to some of his work. Hey, you might have your world turned upside down, too! If you get a chance, be sure to check him out playing live. I’ve seen him four times, and every concert impresses me with the consistency of his playing. He replicates the passages recorded in the studio flawlessly, and if you’ve heard his stuff, you’ll agree that it’s no easy feat. A contrast to say, Eddie Van Halen, he barely moves, preferring to stay put in front of a monster rack full of equipment, (typically Mesa Boogie Mark V amplification, and a lot of effects processing), while playing his signature Ernie Ball Music Man guitars. If you’re so inclined, check out the gear page on his website. It’s an interesting read, and one more reason to win the lottery! So, what are the vital stats to this Petrucci fellow? He was born July 12, 1967, and is, as far as I can tell, a robot. Well, he hasn’t come out and said it yet, as robots are still kind of, well, taboo, even with the success of that old Robin Williams movie Bicentennial Man. 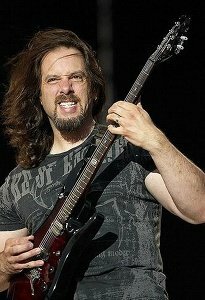 One of the founding members of the progressive metal band Dream Theater, he has also appeared on Joe Satriani’s G3 tour six times, more than any other guest. His playing is heard on numerous other albums and projects, and has a solo album titled Suspended Animation. Highly regarded in the guitar community, he’s also a fine teacher. I highly recommend his book and DVD Rock Discipline. The way he breaks techniques into categories has helped me tame the exercise jungle, and his calm, patient style belies his formidable technical prowess. In addition to all the music, John is a fan of bodybuilding. I spent most of one G3 show alternately wondering how on earth a human can play six-billionth note passages so flawlessly, and what exactly happened to his physique. I think the gym (practice) is the answer to both. However, he is freakishly skilled. Again, I present to you the robot theory. While I am, of course, joking, there is a certain super-human quality to Mr. Petrucci’s playing. Some people love it, and as they say, there’s always the “haters gonna hate”, too. It’s interesting to compare flawless technique and seemingly unlimited speed to the slower and earthier sound of, say, Stevie Ray Vaughan. While there’s a multitude of people who love argue one way or another, just like my extended family discussing politics, sitting around debating who’s the “best” doesn’t really matter. What we can learn from a comparison, though, is our own personal views on polish versus grit. Does it make a difference in “soul” or “feel?” and apply that to our playing. At the end of the day, I personally think it’s about expression, and the creative visions that shredders like John and the bluesmen like Robert (Johnson) spin are different. The question that truly matters is: What does your vision sound like, and how can you realize it? Josh Urban is a musician, teacher, and entertainer living in the Washington, DC, area. When he’s not cracking jokes or plotting the overthrowing of the world, he can be found listening to classical music or on the phone wondering if he could speak to the booking agent in charge.